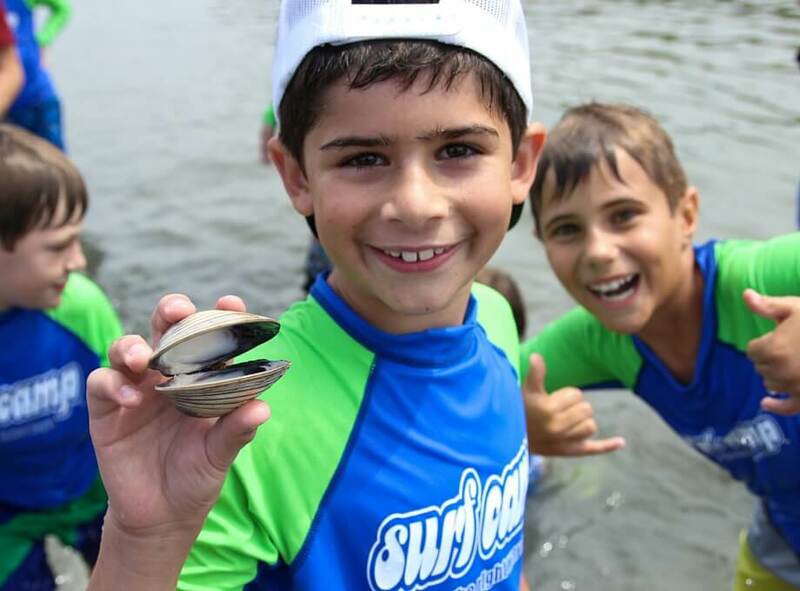 Grom Ocean Academy is a full day, week long summer camp experience intended to build on the lessons covered in Guppy Camp. This ocean adventure is designed for kids ages 8 – 11 who are interested in the ocean and all its inhabitants. Together we’ll travel around Wilmington following the coast from Fort Fisher to Surf City, soaking up the waves and habitats along the way. 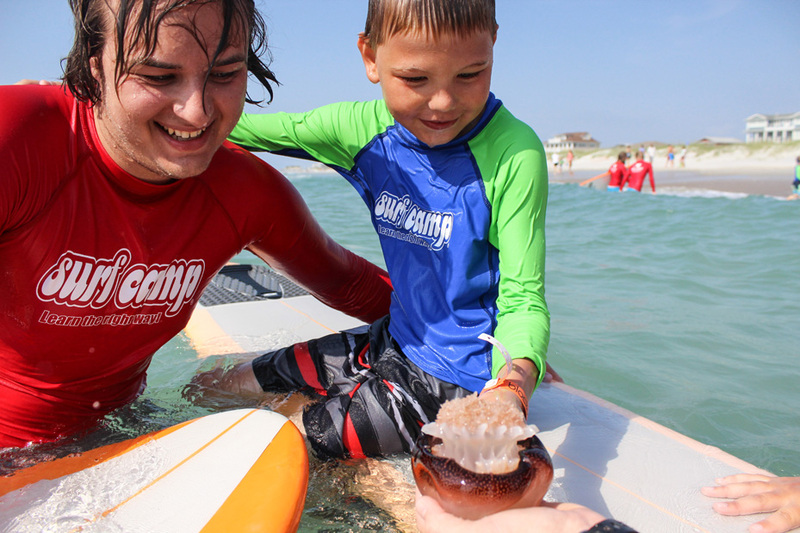 This program is ideal for the budding surfer or marine biologist. Each day we’ll log time in the water either surfing or working on advanced boogie boarding skills. In addition to water instruction, we’ll also transition to other local habitats near the dunes, along the marsh, and in the tide pools for an in-depth study of the animals that reside there. 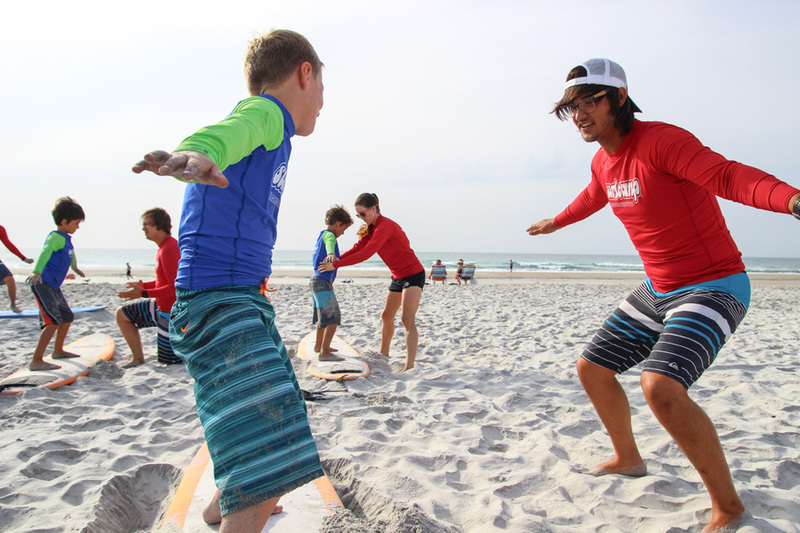 Participants will earn their Advanced Junior Ocean Safety Certification and will be familiar with rip current awareness, the anatomy of a wave, surf advisories, safe fishing practices, hurricane preparedness, and basic emergency procedures. By week’s end, your camper will be teaching you how to stay safe at the beach. in water where they can’t touch the ground. Completion of Guppy Camp is beneficial and recommended. Unlimited photos taken by our staff photographer available. 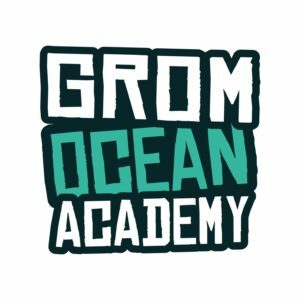 Grom Ocean Academy is Monday through Friday, from 9:00 am – 4:00 pm. Campers are dropped off and picked up at our Wrightsville Beach office location. Late pick-up options until 5:00 pm are available to accommodate working parents. NC Camps are filled on a first come/first serve basis. Tuition includes American Red Cross Lifeguard/CPR/First Aid certified counselor instruction, WB Surf Camp’s Advanced Junior Ocean Safety Certification, daily transportation to all activities, activity fees, Sea Turtle Hospital tour and donation, admission and behind the scenes tour of NC Aquarium, rash guard, all equipment, certificate of achievement, and memorable group photo. To secure your spot now, please select from the available dates listed below. 9:00 am marks the start of a new adventure where your child will spend a week as an ocean explorer. From the crest of a wave to the muddy depths of the salt marsh – we’ll explore them all, learning many valuable lessons along the way. 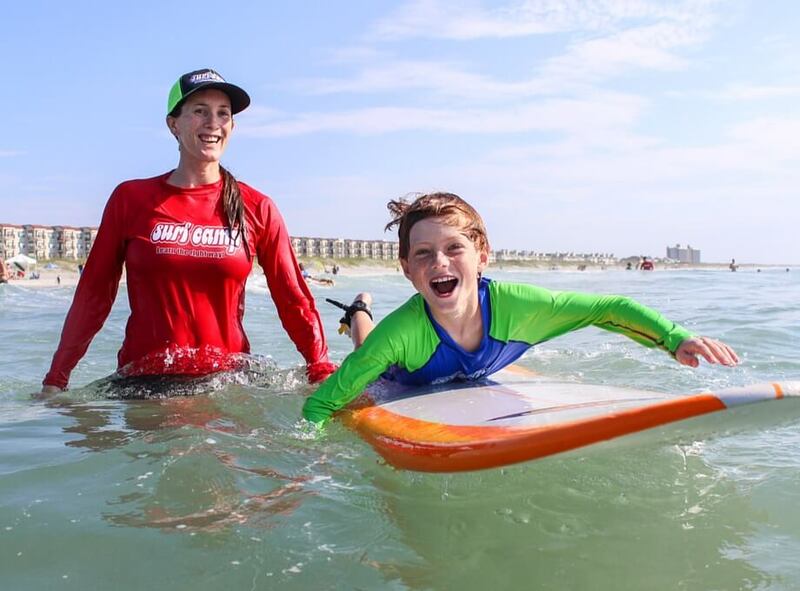 We’ll kick of the summer in style by heading down to Kure Beach for our first surf lesson. 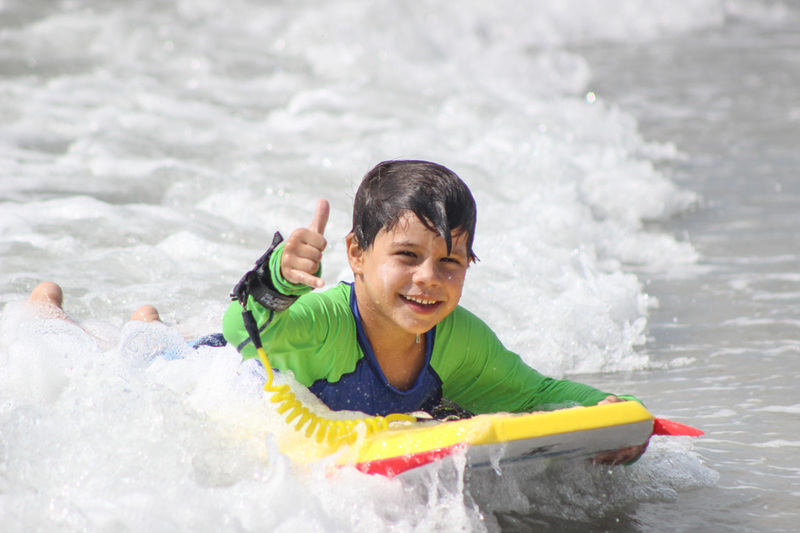 After a brief orientation and swimming assessment, campers will be guided through the WB Surf Camp ground school, where they’ll learn the art of popping up properly on their surfboard. We’ll then transition from the sand to the surf for some wave riding fun. After an action packed morning, we’ll relax with a fishing session on the Kure Beach pier. The pinfish, spot, and flounder are waiting! Then as the tide continues to drop, we’ll travel to Fort Fisher to explore some of the tide pools around the coquina sandstone, North Carolina’s only naturally occurring rocky outcrops. Our summer odyssey continues with a road trip to Surf City. We’ll begin the morning by working on some advanced boogie board maneuvers. We’ll be able to apply lessons learned in our surf lesson to the boogie board, in particular learning how to properly read waves for the best take off. We’ll also spend part of the morning under the waves as we swim at the South End of Topsail Beach. The super clear water here will allow us to see a variety of fish and other ocean dwellers. Don’t forget your goggles! During the afternoon, we’ll dive into the world of sea turtles with a visit to the Karen Beasley Sea Turtle Hospital. From egg to hatching to adult, turtles face many threats both on land and in the ocean. We’ll become familiar with some of the obstacles they face, while also seeing the positive impact humans can have due to the tireless work that the super human volunteers do at the hospital. Make sure that you say a special hello to Lenny, a Kemps ridley who serves as one of the hospital’s spokes-turtles. 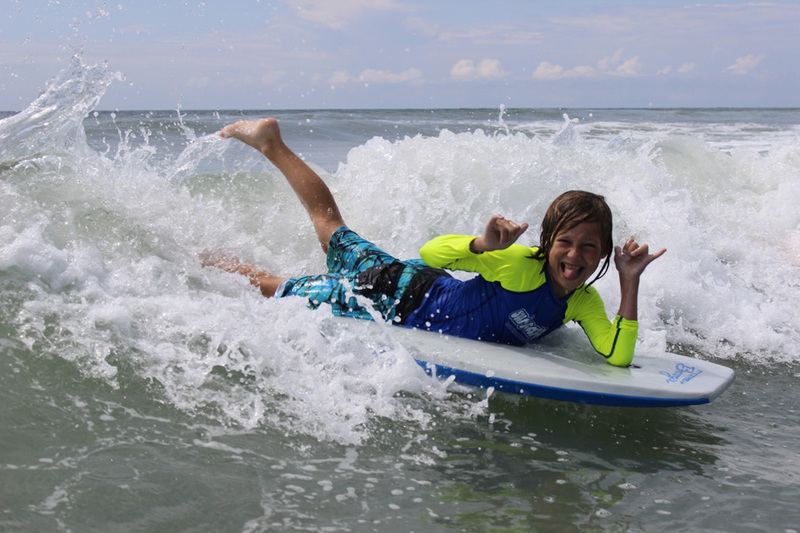 We’re half-way through our week of adventure and we’ll spend the morning riding the best waves at Wrightsville Beach. Developing proficiency on boogie boards will help us during our next surf session, since our water stamina will continue to grow throughout the course of the week. In addition to working on water skills, we’ll continue to develop our ocean safety awareness, so that by the week’s end we’ll achieve our Advanced Junior Ocean Safety Certificate. This afternoon we’ll get experience collecting marine life from along the pilings and docks at Wrightsville Beach. We’ll use dip nets to sample the fish, mussels, algae, crabs, and sea squirts that call these docks home. Afterwards, a sample from the plankton net will reveal what many of these creatures look like in their juvenile form. This is our final day to work on advanced boogie boarding skills. Campers will see how the addition of fins will increase their propulsion in catching waves. 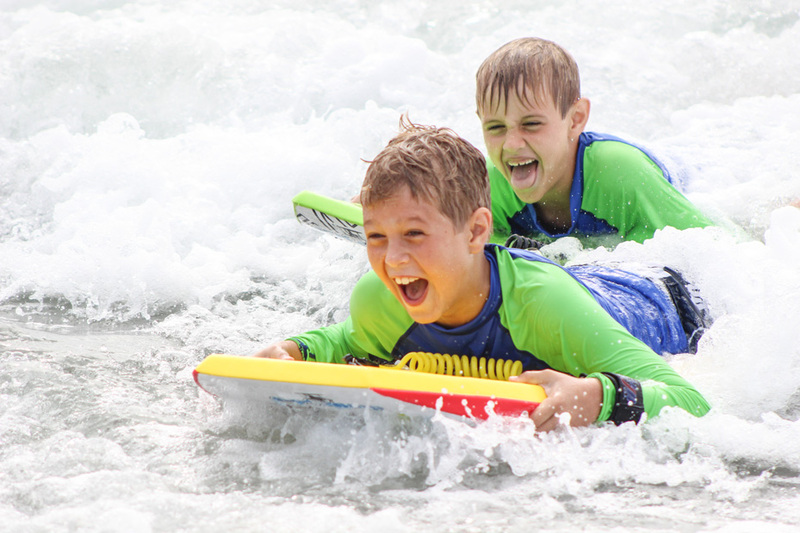 Having boogie boarded along different beaches at different times, they will see how both the tide and the position of the beach can change the formation of the waves. It’s a short trip to the other side of the island – just a three minute walk. Barrier islands are long, skinny strips of land that are vital to protecting our coast from storm surges and hurricanes. The backside of the island is also where you find one of the most productive habitats in the world – the salt marsh. Campers will use dip nets, seine nets, and cast nets to catch and release some of the inhabitants of this habitat. They’ll also learn a lot about commercial seafood, since most species served in restaurants get their start right in the salt marsh. It’s the final day of camp, and we’re going to squeeze a lot of activity into it. We’ll start off with our second and final surf session. Now that we’ve got a week of water activity under our belts, you’re bound to see an improvement in your camper’s surfing ability. 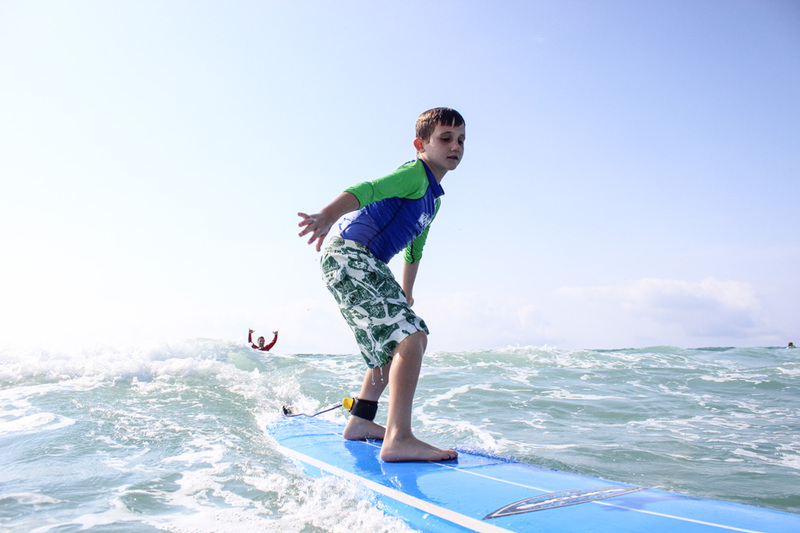 Campers will be paddling out and popping up on the waves like experienced surfers. After lunch, we’ll have one final adventure together at the Fort Fisher Aquarium. Many campers have been to this aquarium, but we’ll see it from a completely different perspective. We’ll be guided through a behind-the-scenes tour to see all the animals that are kept on display, as well as some areas that you don’t see on a typical aquarium visit. It may inspire your camper to want to be an aquarist. 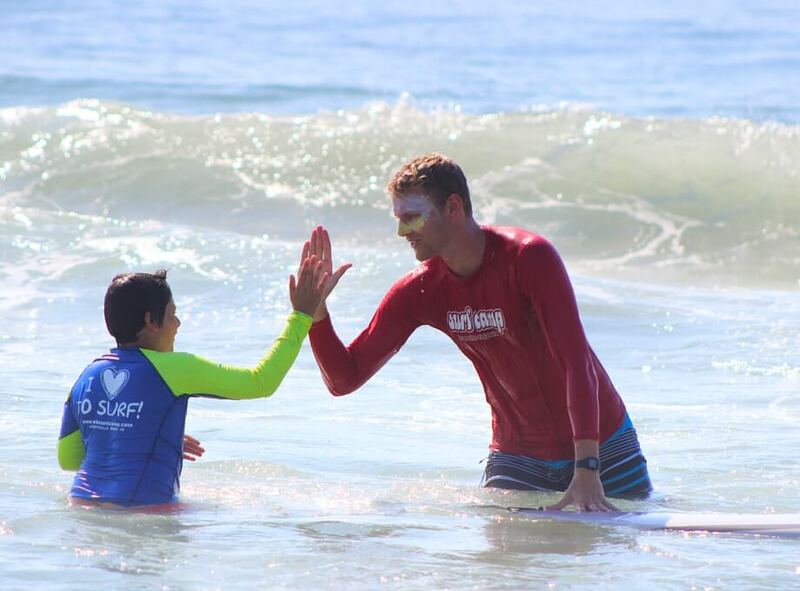 It will be tough to say goodbye at the end of the week, but we know that many of you will see each other soon, probably in our kids surf camp! 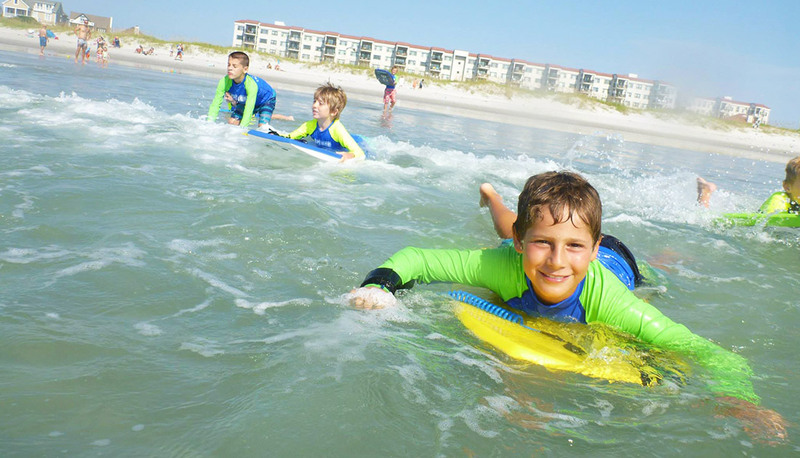 For our many clients traveling to Wrightsville Beach just to attend Grom Ocean Academy, please contact our office info@wbsurfcamp.com for a list of our favorite places to stay. 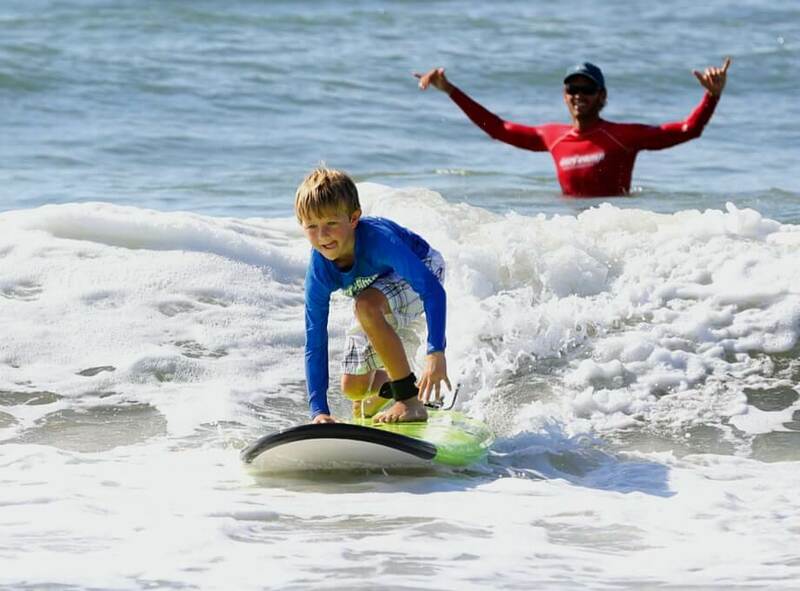 Are the kids going to get to surf during Grom Camp? 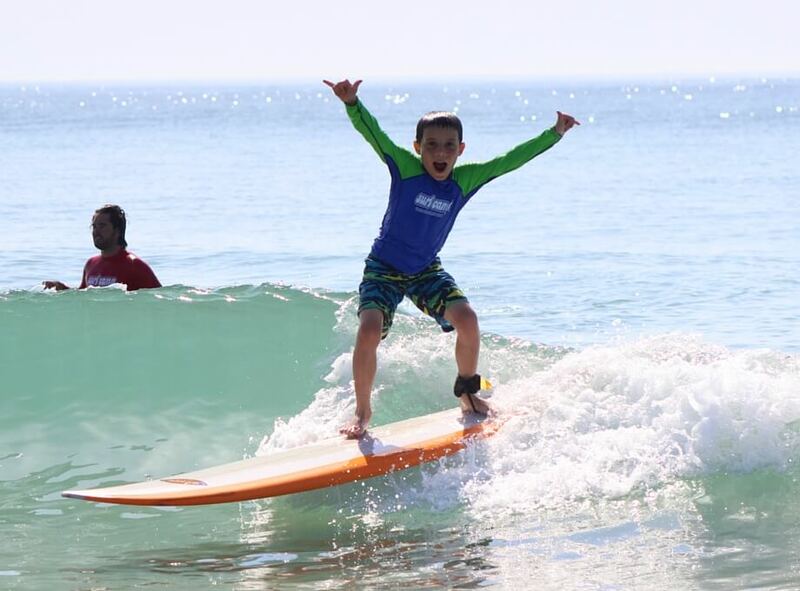 Yes, campers will participate in two surf sessions during the week. When not surfing, we will spend the rest of the week working on advanced boogie boarding skills. 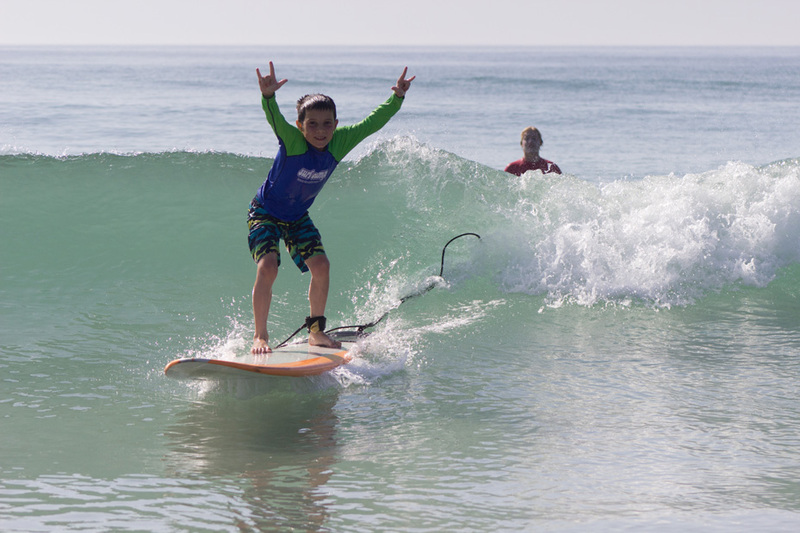 If your child wants to log more time on the surfboard, then maybe our Kids Surf Camp would be best suited for them. My child isn’t the strongest swimmer, is Grom Camp for them? Campers that are looking to build their water stamina in the ocean should consider our Guppy Camp. This program is specifically designed to improve kids’ comfort level in and around the ocean. Are there any requirement to attend Grom Camp? Since surfing can be a physically demanding sport, we do require that campers have strong water skills. They need to be able to swim 25 meters unassisted and be comfortable in water where they can’t touch the ground. Completion of Guppy Camp typically gives campers this level of competence. What time does the camp run? Drop off is at 8:30 am and pick up is at 4:00 pm. To accommodate busy parents, late pickup is available until 5:00pm for an additional charge of $50 for the entire week. 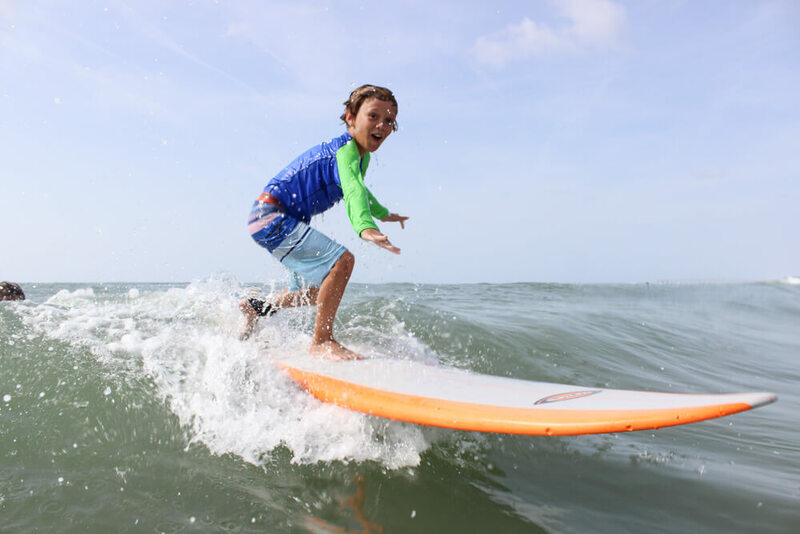 All our Groms are provided with long sleeve rash guard rental with SPF 50 as well as boogie boards and all the gear they’ll need for pier fishing and salt marsh crabbing and clamming. Is there a lifeguard at the beach you use? I ‘m worried about some of the safety aspects of a surf camp. All of our camp instructors hold current American Red Cross Lifeguard Certifications including CPR for the Professional Rescuer and First Aid. One might even say that we over-qualify our team with this many lifeguards. We have an impeccable safety record and are very proud of it! What happens if conditions are unfavorable for boogie boarding on a particular day? 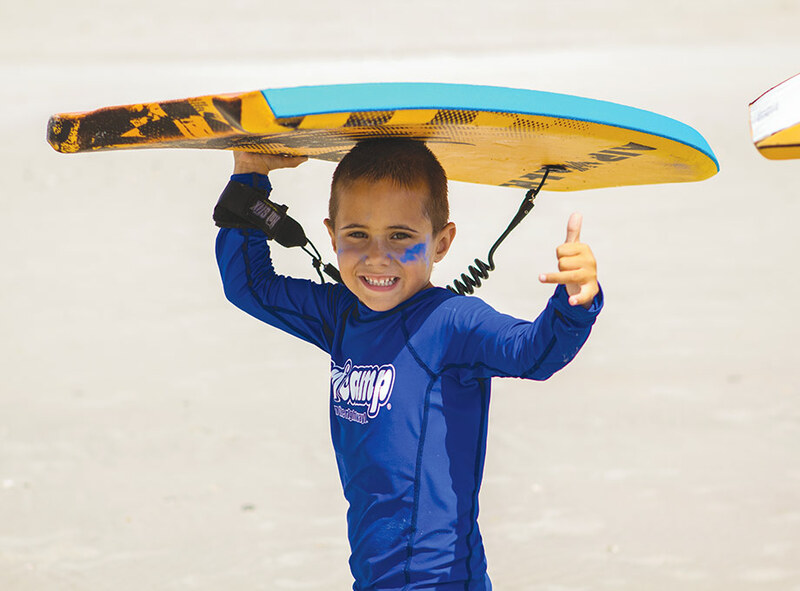 To accommodate larger surf or stronger wind conditions, the Grom counselors will incorporate fun-filled activities to educate the kids on staying safe and having fun in our ever-changing ocean. Safety is our primary concern, so in the rare event lightning or other storm system keeps us from completing our typical schedule, we have a variety of activities that our instructors will lead the campers through. There are always activities to be done in our Grom Camp Logbook as we work towards our Advanced Junior Ocean Safety Certificate. In addition we also have available fish prints, ocean-themed games, and seashell crafts. We are traveling to North Carolina from out of town. Are there hotels, rental properties, or campsites nearby that you can recommend? We maintain a list of recommended campsites, hotels, and real estate companies in the area. Please e-mail us at info@wbsurfcamp.com and we’ll be happy to send it!